The Metra Electric is a commuter rail line that mainly runs through black communities, connecting the city’s southern suburbs and South Side neighborhoods to downtown Chicago. Uncertainty around federal funding to extend the Chicago Transit Authority’s Red Line to the city’s southern limits has sparked discussions on whether to build the $2.3 billion extension at all or find alternatives to improve transit for Far South Side residents. In January, the city announced the final alignment for the 5.3 mile extension to 130th Street. That’s key for the CTA to secure $1 billion in federal funding needed for the project that wouldn’t see construction start until 2022. Though the city has proposed using transit TIFs (tax increment financing) to fund part of the extension, some transit advocates contend that wouldn’t be nearly enough to make a dent in the cost. And others question whether the Trump administration would give the city $1 billion for a project of this scope. Some transit advocates say there is a quicker and less costly way to improve transit on the South Side by converting the Metra Electric District (MED) main line into rapid transit. Retrofitting Metra’s existing rail infrastructure to accommodate rapid transit, they say, could be completed in less time than it would take to build the extension and without displacing privately owned properties, as the Red Line extension would. But putting the Red Line extension on the backburner where it has sat for decades would be a disservice to the Far South Side, community members say. Mayor Richard J. Daley promised to extend it beyond its 95th Street terminus when he cut the ribbon on the transit line nearly 50 years ago. That debate found its way into Transport Chicago’s annual conference held June 1, where community members, transportation experts and policy analysts debated the merits of each plan. 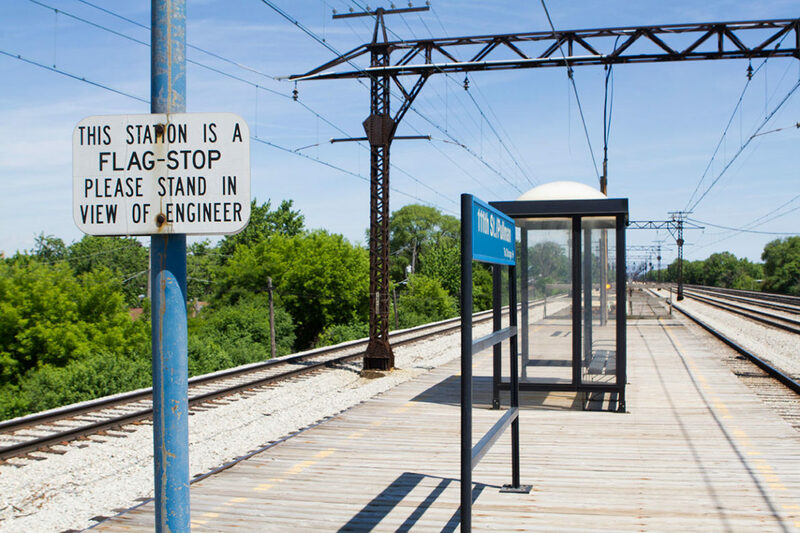 The extension would bring four new stations to the Far South Side: 103rd Street, 111th Street, Michigan Avenue and 130th Street. And it would create more than 6,000 temporary construction jobs and dozens of new retail businesses to serve the new stations. See our series on the proposed extension of the Red Line. South Side resident Michael LaFargue says extending the Red Line south is all about equity – transit equity, economic equity and environmental equity. The loss of manufacturing jobs, he said has devastated the Roseland community economically while lack of rapid transit has made access to jobs and opportunities even more difficult. The 111th Street station, LaFargue added, could be branded as Greater Roseland Hospital Medical District similar to the Blue Line’s Illinois Medical District. The Michigan Avenue station could reinvigorate that mile-long business corridor, making it the ‘Magnificent Mile South,’ he said. “This is a catalyst for economic development and branding,” said LaFargue, president of the Red Line Extension Coalition, a community-based group. Policy analyst Daniel Kay Hertz of the Center for Tax and Budget Accountability says both projects are important and would have significant impact. He estimated a cost of $27 million per mile to convert the Metra Electric’s South Chicago branch into rapid transit. Hertz based that figure off a 2012 Chicago Department of Transportation report which puts the cost of converting MED’s South Chicago branch to Millennium Station — not the entire line — at $350 million. Hertz said there’s no reason the per-mile costs would differ substantially to convert the entire MED line. In comparison, the Red Line extension would cost about $434 million a mile. “It is basically logistical stuff that they need to do as opposed to the physical engineering and construction of several miles worth of new rail lines and stations,” Hertz said. A Metra spokesperson said the agency is not actively studying the MED conversion but it remains on a list of projects for future consideration. However, the spokesperson noted that the CDOT’s cost analysis did not include improvements to Millennium Station or other infrastructure work to accommodate increased usage. The MED originally ran as rapid transit and the line’s South Chicago branch ran every 10 minutes during the 1940s under its then-operator, Illinois Central. That frequency reduced when it became part of the Regional Transit Authority. Now the line has frequent service during peak evening and morning hours but runs every one to two hours during the mid-day. The idea to convert the commuter-rail into CTA-style “L” service resurfaced again when transit advocate Mike Payne touted the plan as the Gray Line in the 1990s. It has gained traction in recent years thanks to advocacy groups like Coalition for a Modern Metra Electric and Active Transportation Alliance who want the MED to run every 10-15 minutes. Last year Metra increased mid-day frequency on the line to every 20 minutes between Hyde Park and Millennium Station. But Metra’s fare structure could create a burden for low-income riders. Metra’s fares are distance-based where CTA charges a flat fee. And since there is no fare integration between Metra and CTA, riders would have to pay two full fares. There’s no fare discount to transfer from one transit system to the other. Andrea Reed of the Greater Roseland Chamber of Commerce still sees value in converting the Metra Electric. She stressed that she is not against the extension but supports the Metra conversion as a way to give South Side communities more transit options. Better transit, she said, can boost the incremental changes happening on the Far South Side, including Pullman being designated a national monument in 2015. “Communities like ours have been grossly overlooked for years,” Reed said, noting that the Greater Roseland area is a transit desert. Yonah Freemark, a PhD student at Massachusetts Institute of Technology and founder of the blog The Transport Politic, supports extending the Red Line but won’t rule out improving the Metra Electric. Ideally he said the city should do both since Far South Side communities have been systematically deprived of good transit for decades. “The idea that we are having to choose between one or the other really speaks to the mentality in this country about how we invest in disinvested communities,” Freemark said. The proposed extension of the Chicago Transit Authority’s Red Line from 95th Street to 130th Street is among the most costly and potentially transformative public infrastructure projects the South Side has seen in decades. At an estimated cost of $2.3 billion and affecting 128,000 people, transportation experts say, if done with the community in mind, it could bring thousands of jobs and economic opportunity to the area. The key issues are fare integration and train frequency. Allowing CTA fares for all trips within CTA’s current territory is a political decision, not a technical one. Metra has committed to implementing Ventra system wide. Thus with card readers at the stations, riders can be charged CTA fares as a software patch. The other issue is more frequent trains. This means more crews, and probably some more cars. There is NO need for $27million per mile to run more trains on the South Chicago branch. The major cost on the mainline would be restoring the ‘Wildwood’ Station at 130th which was shuttered in the 60s, and adding switches to allow using 130th as a short terminal for the more frequent service. Serving the other part of CTA’s RedX involves the South Shore Line (NICTD) as far as Hegewisch. CTA proposes a 130th St terminal precisely where South Shore’s station existed until 1960. 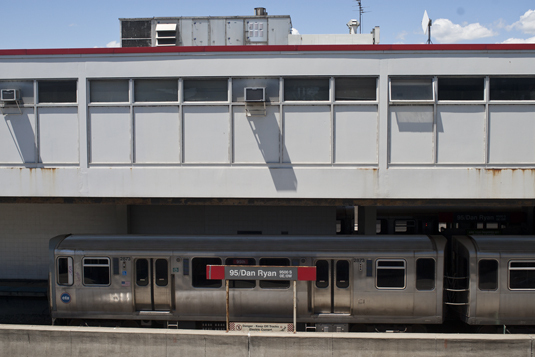 Adding a siding and rebuilding a platform would be way cheaper than a full CTA elevated installation. As precedent, during an equipment crisis on South Shore Line, Metra ran diesel hauled bi-levels to Hegewisch. Not only is this way cheaper, and easier to get done, but the key is the fare integration. Making local Metra service accessible to CTA riders gives them more travel options which is the purpose of transit. I knew there had to have been a station on 130th street. IMHO a station could be built at 130th and Indiana for a modest cost. Or have a bus line that runs from the Riverdale area to the Blue Island line station at 121st and Michigan. That’s a 5-7 minute ride. It will help the rest of Roseland by taking bus traffic off Michigan avenue from the 111/115 and 119 routes. I’m glad the more economical idea of improving Metra Electric service as an alternative to the CTA’s self-serving Red Line Extension has gained an audience. Many of the positive aspects were mentioned. Mike Payne’s original idea required segregation of City from suburban Metra services, eliminating the integration still possible today. Turnstiles and fences would pose architectural problems and possible elimination of suburban Metra train stops. The Idea of converting local services to CTA equipment not only would require a costly fleet of cars, but also conversion to a lower voltage 3rd-rail electrification and signaling that are incompatible. Moreover, this would violate FRA standards for separation of heavy rail and rapid transit operations. The most expedient program would be for a CTA purchase of service from Metra for South Chicago and Blue Island routes and intermediate stations – two routes for much less than the cost of one. This avoids the current issue of coordinating fares and division of revenue between Metra and CTA. Metra has sufficient equipment for more frequent all-day service and is close to implementing PTC. In order to be compatible with CTA and Metra, Ventra cards can be used to issue a proof of payment card for onboard inspection rather than unlocking a turnstile. Suburban passengers can board or alight at any City station without restriction and use the Metra mobile app for passage. As I understand it, the Metra app is not currently compatible with tapping in on CTA buses and turnstiles. I failed to mention the funding issue which is the gorilla in the room with fare integration, even if the technology is available. Metra gets none of the sales tax revenue collected in the City; yet Metra serves 79 stations and terminals within city limits and brings almost 260,000 commuters downtown each day, about half of the number of CTA rail boardings. A purchase of Metra Electric services to South Chicago, Blue Island, and intermediate stations by the CTA would relieve a burden for the suburbs; but increase the operating cost for the CTA for two routes rather than for a redundant extension of one. Expanded rail service would allow a reduction in both Pace and CTA bus operations and costs. Mildly irritating but still related issue is you can’t get a $10 weekend two day pass for Metra Electric in 2018? Every other Metra line is included but not the South Lakeshore line. This would start bringing money in and eventually the added ridership to fund the additional station or maybe even a spur line station to the far South? Ventra is a great thing as far as it goes, but the CTA/Metra/Bus line lack of synergy really becomes frustratingly apparent from 11 PM to 5 AM?